Tolkien never tells us the whole truth about the great swords forged by the elves… Unlike the swords of men and orcs, elvish swords gradually taper so that their blade is a slender, triangle with a deadly precise tip and razor sharp edges. 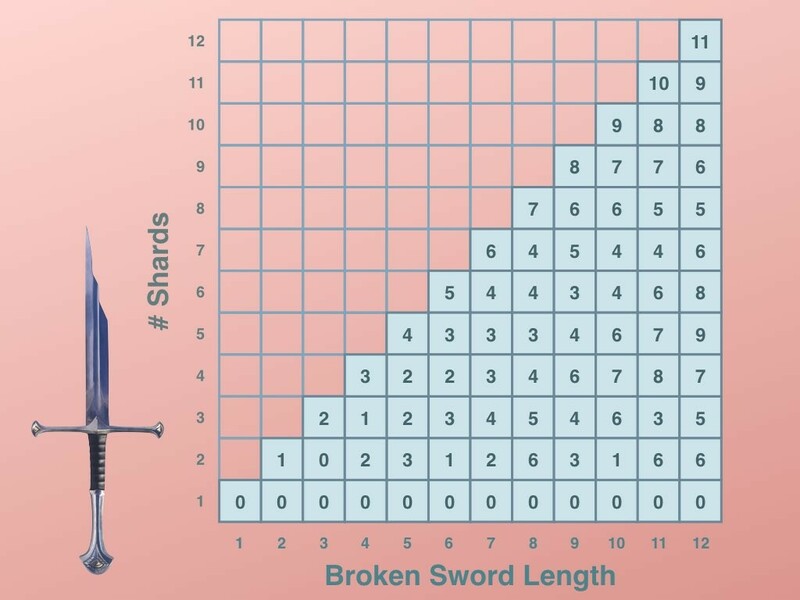 If elven swords are deadly, but more shatter prone than other swords. If they are broken in battle, the breaks always occur so the fragments of the heaviest shard minus the lighter shard is as small as possible. 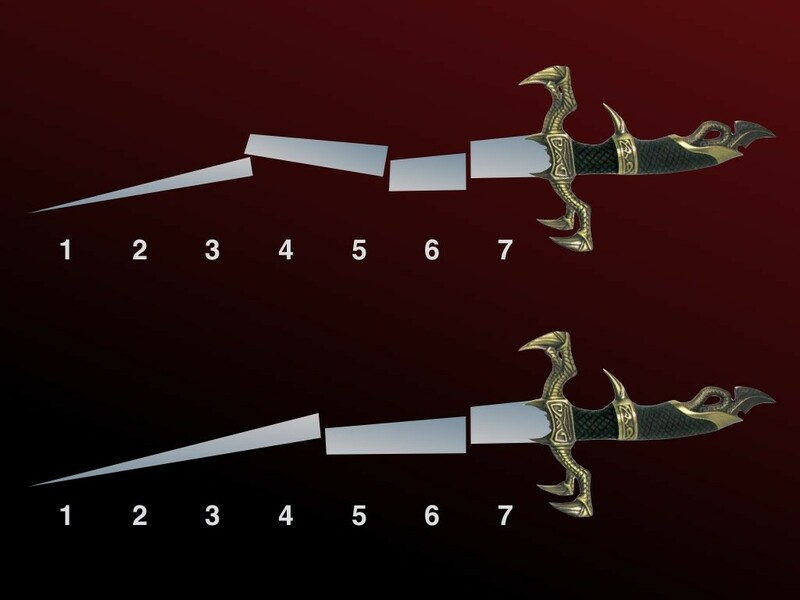 For example, if this elvish blade broke in two – where would it snap? Between which numbers? Would it break between the 4 and 5 or between the 5 and 6? Remember for an elvish sword, the weights of the heaviest minus lightest shard are forged to be as small as possible. 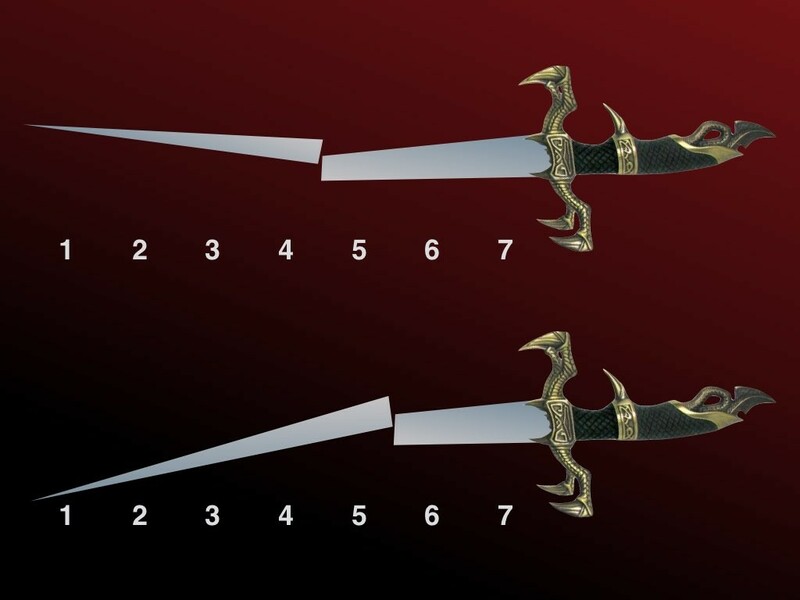 In this case the upper sword has shards of weight 10 elven units (1+2+3+4) and 18 elven units (5+6+7). The difference is 8. That’s too high. This sword is wrought by humans or orcs. 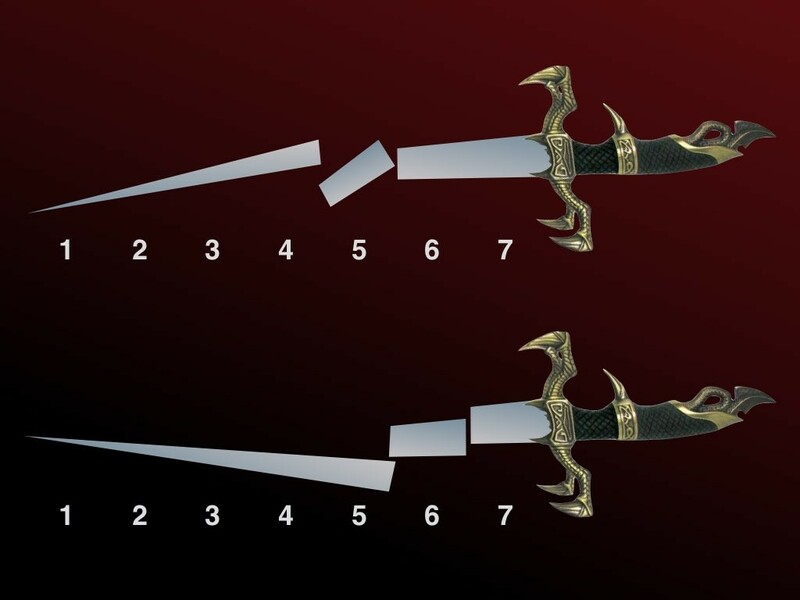 The lower sword has shards of weight 15 elven units (1+2+3+4+5) and 13 elven units (6+7). The difference is 2. That’s as good as the elves can get with a seven span sword and two shards. It was an elvish sword in happier days. 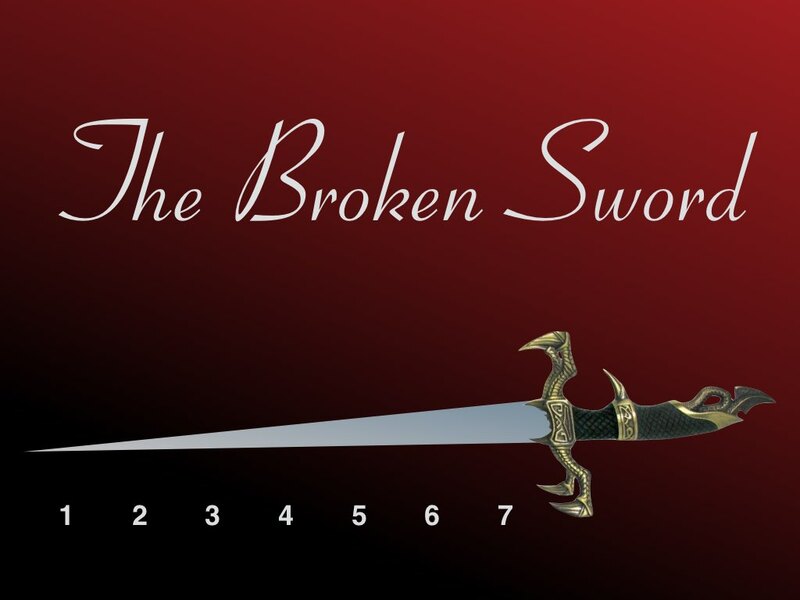 Take a moment for your class to figure out which, if either of these broken swords might be elven. Remember: The score is heaviest shard minus lightest shard. This should be as as small as possible. Neither of the swords on the last slide were elven. The difference between the heaviest and lighter shards was too great. Both of these swords are elven. The one on the bottom is in three shards: (1+2+3+4), (5+6), (7). The biggest minus smallest equals 11-7=4. That’s as good as the elves can do. The one on the top is as good as the elves can do when a sword is broken into four shards. The score is 9-6 = 3. 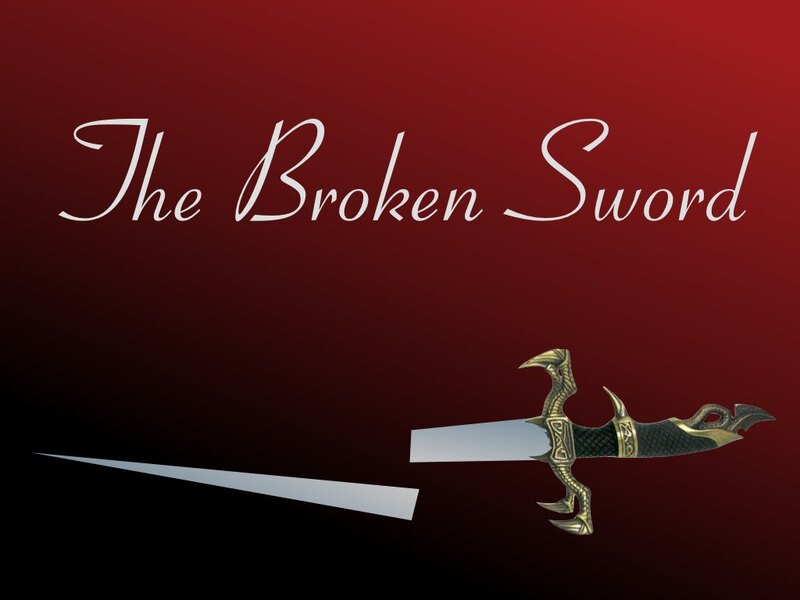 How do you introduce Broken Swords into the average Orc / Wizard classroom? We are going to treat this as a mini mathematical universe. The students start knowing nothing. Point to students one at a time. They have three options. 1) They can do a powerful spell in any cell. This will tell exactly what is in that cell. 2) They can do a weaker magic spell. This will ONLY give the score of the elven blade OR give the shards. 3) They can guess what is in a cell. If they guess wrongly, reveal the cell – the wrongly guessing wizard is tongue-in-cheek chastised. Here are the contents of all the cells. Your students must figure out the rules for how to complete this table. If they need a hint, steer them towards the seven length swords and show them the first slides of the presentation. After most of the class understands, you can hand out a puzzle sheet – or ask them to extend it up to and including 20. Some students may prefer to just store their best score in a triangular grid. 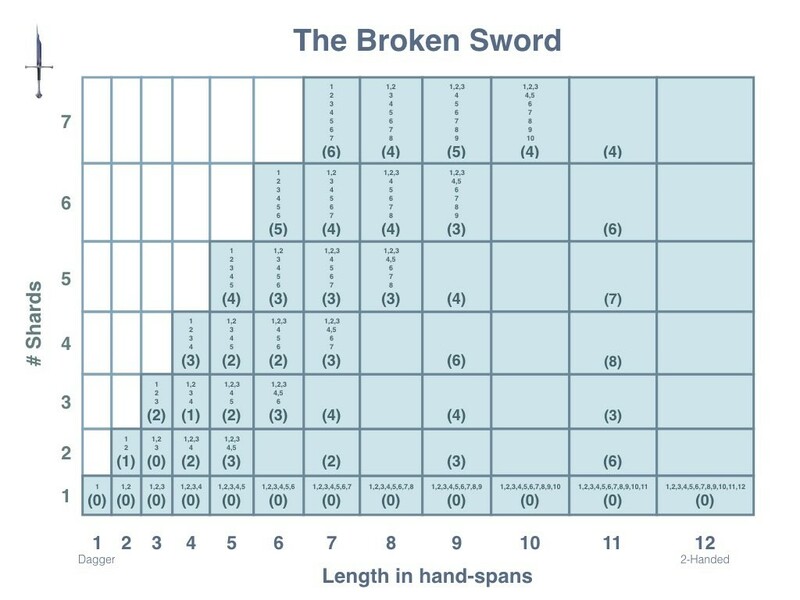 A week after initial introduction of the puzzle, some students will be interested in seeing that swords of length 3, 20, 119, 696 etc. have the special magical property that a break into two shards is perfect! The score is zero! Of course you might not tell them this, but ask them to explore what is special about these swords. I’m most interested in the minimal score for each column (excluding the # shards = 1). 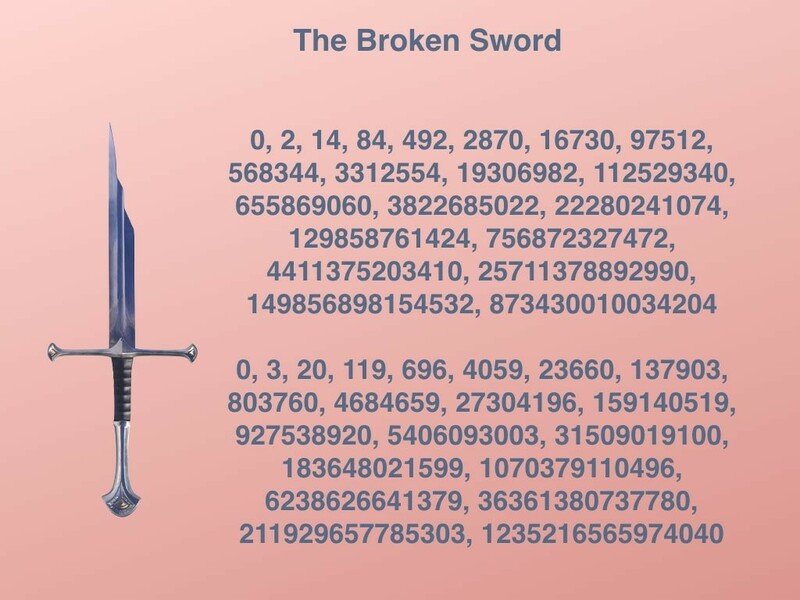 How does this number behave for longer swords? Download the pdf of these slides here. 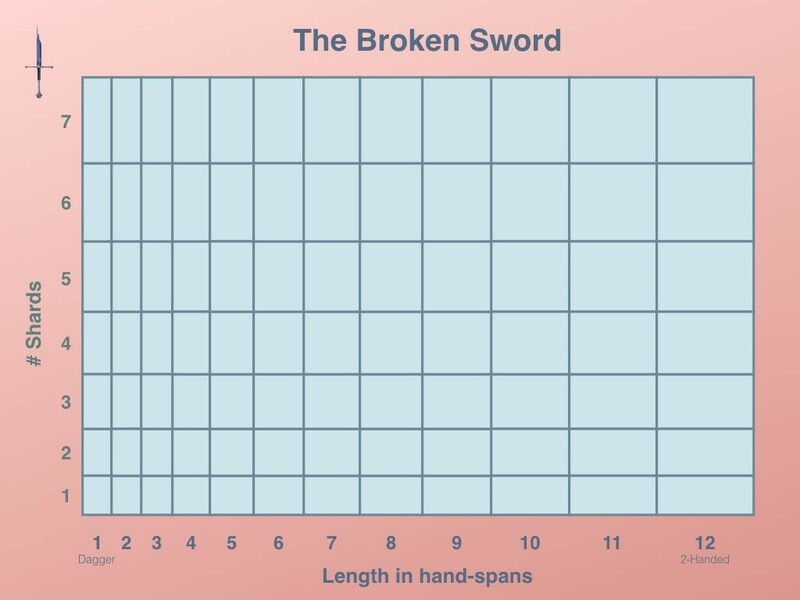 Broken Swords may be used for students using only addition, but older students can employ both multiplication and division to make the exploration more efficient. 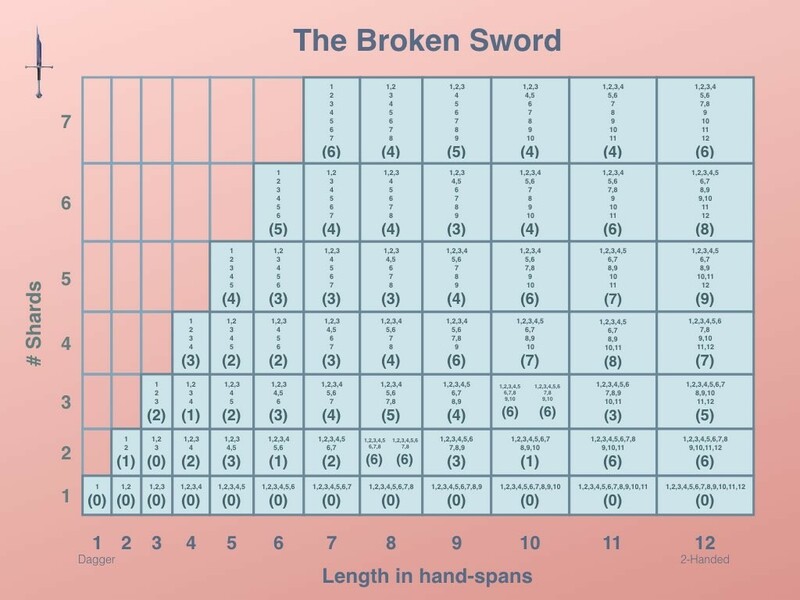 Broken swords should probably be taught as a mini-mathematical universe. For more about this style of teaching, see my blog post here.